St. John Vianney College Seminary has for over 40 years provided quality education in priestly formation. 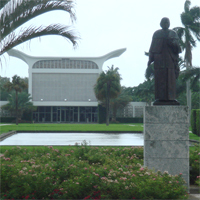 St. John is the only bilingual college seminary in the United States, a factor which reflects the rich cultural diversity of the church in South Florida. The seminary provides an academic setting which is challenging and a pastoral setting which is multicultural. St. John's is a place where young men not only grow spiritually but also pastorally in order to preach the Gospel of Jesus Christ to all the people. 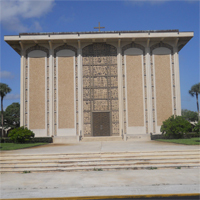 St. Vincent de Paul Regional Seminary was opened in 1963 and serves not only the North American communities but also the Caribbean and South and Central America. Because of its location and history, St. Vincent de Paul is the only bilingual and multicultural theologate in the United States. 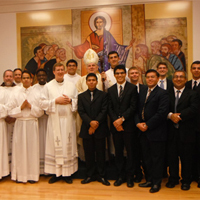 Archbishop Wenski officially opened the Redemptoris Mater Seminary on December 11, 2011 with a first group of 12 men. Once ordained, they will be incardinated in the Archdiocese of Miami and work in the parishes of the Archdiocese or any other place in the world where the Archbishop may decide to send them. The seminarians receive their academic formation at St. John Vianney Seminary or at St. Vincent de Paul, according to their level of studies. These men came to discover their vocation through the Neocatechumenal communities in their home parishes. The Neocatechumenal Way, which was defined by Pope John Paul II as "an itinerary of Catholic formation, valid for our society and for our times," is an essential ingredient in the formation of these seminarians. The RM Seminaries are a fruit of the Second Vatican Council and an inspiration of the Blessed Pope John Paul II. The first RMS was opened in the Archdiocese of Rome in 1987. Today there are 100 seminaries throughout the world. Currently in the US there are eight RM seminaries: Boston, Brooklyn, Dallas, Denver, Miami, Newark, Washington D.C., and the territory of Guam.